A WOMAN PRACTICES IN THE AQUATICS COMPOUND IN RIO AHEAD OF THE 2016 OLYMPIC GAMES. IMAGE BY TÂNIA RÊGO/AGÊNCIA BRASIL VIA WIKIMEDIA COMMONS. On which OkCupid date would it be appropriate for a man to mention that he won gold in canoe slalom a couple Olympics back? Would the number change if he hadn’t in fact, medaled? As the curtain falls on the glittering glories of this year’s Olympic Games in Rio, it’s impossible not to wonder what will become of those all-star athletes, not just in the next four years when they may return to the world’s stage for another chance at success, but in the next forty, when their muscles weaken and their triumphs fade. 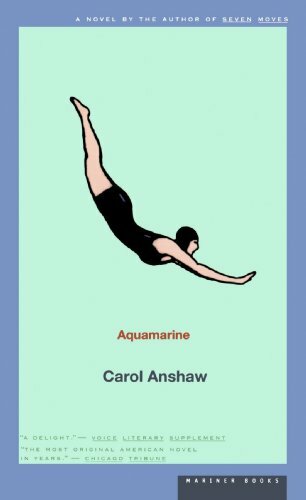 It’s this question that is at the center of Carol Anshaw’s Aquamarine, a novel that charts three possible afterlives for Jesse Austin, a silver medal-winning swimmer at the 1968 Olympics in Mexico City. After her hopes for gold are thwarted by a glance over at rival swimmer Marty Finch who lured the 17-year-old into her first sexual encounter. That one look gives Jesse a slow start off the swimmer’s block and leaves three-tenths of a second behind Marty. “She can’t curse the lapse. There’s no time,” Anshaw writes in the opening of Aquamarine which takes its start just before that fateful leap into the pool. Although Jesse pushes the fumble out of her mind for the time it takes her to get through the “quick trip” to the end of the pool and back, she’ll have the rest of her life to return to it. And she does. Anshaw imagines three possible worlds for a 48-year-old Jesse in which a cast of characters -- Jesse’s difficult mother, nearly-fairy godmother, and mentally-handicapped brother -- remain as constant as her regrets. In the first scenario, Jesse meets and marries a man named Neal and the two of them manage an underground cavern that draws tourists to their humble Missouri hometown of New Jerusalem. Although she tries to find comfort in their little life -- and prepare herself to mother their much-awaited baby -- something inside of Jesse remains snagged to her Olympics upset. Although Neal “didn’t expect her to balance forever on some peak of greatness, or leap to some next peak,” there’s something inside of Jesse that cannot allow content to be enough, having come so near to the splendor of an Olympics gold. In another of the possible worlds Anshaw imagines for Jesse, she is an English professor who lives in New York City with Kit, her actress girlfriend who plays a vampy nurse on a soap opera. The two make their way to Jesse’s mother’s 65th birthday party in New Jerusalem, a place where her Olympics afterglow still shines, and yet, with Kit by her side, she hardly notices the shadow of that decisive moment. And yet, she’s still nagged by “small tugs of doubt about Marty” Jesse still hasn’t been able to decide if their race night tryst was born of “pure impulse and mutual desire” or if it was a calculated stunt to throw her off of the flawless freestyle with which she fully expected to win first place. In this version of her life, that fixation seems most prominent. As a lesbian, it’s harder for Jesse to reconcile the fact that her sexuality was used against her. The Olympics are “something that happened to another person, someone she knows well enough and remembers fondly, but not quite her,” in the last version of Jesse’s life as a financially struggling single mother of two in Venice Beach, Florida. As the owner of a swimming school and mother to a 17-year-old old who’s got the potential (though not the desire) to be a world-class swimmer, Jesse is closest to her life as an athlete than in the other iterations but feels more removed from her past successes. It’s as though the presence of the chlorinated water keeps her from becoming introspective about the life she lived within it, for better or for worse. Although her life’s circumstances seem the most bleak in this last scenario, Jesse seems to draw on the inner fortitude of an athlete. Having trained their bodies for feats and speeds that were impossible until they mastered them, it’s easy to find oneself wondering what becomes of all that possibility. 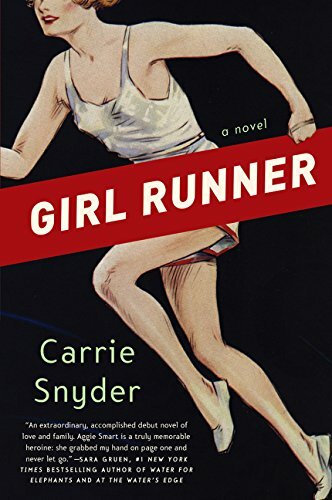 It’s this slow petering out is the subject of Carrie Snyder’s novel Girl Runner, which follows Aganetha Smith who not only won an Olympic gold, but did so against the headwinds of patriarchy. The 1928 Olympics in Amsterdam were the first in which women competed in track events -- although only in the 100 meter run, the 4x100, and the 800. Smith won the 800 -- although she was a long distance runner -- and feels as protective of her victory as she is pained by it. When a reporter asks for her for an interview ahead of the 1984 Olympics -- the first in which women were allowed to run the marathon -- Smith refuses to speak with her. Rendered ineffable by the sacred experience of being the best in the world at something, Smith struggles to say much about the experience. Nearly 60 years later, she can barely believe in her own crowning glory: “I can’t get straight whether that happened, or whether it’s a story I’ve told myself until it might well have happened,” she thinks when asked by a Canadian marathoner what it felt like to win. So many of the athletes who have awed us over the last few weeks have spent entire lifetimes training their bodies and preparing their minds for one fateful moment -- one that might last mere seconds for so many of them: sprinters, long jumpers, divers, weight lifters, archers. Through all that secondary sports coverage, profiles and interviews, we get a sense of how they’ve managed to coax their bodies to heights that exist far beyond the reach of those of us watching transfixed from the comforts of our couches. We’re shown the lead up: photos of a toddler in a pool, a high schooler with a trophy, a college athlete talking strategy with her coach. Half of the excitement and anxiety of watching the Olympics comes from a sense of the backstory. So much has led up to the moment we happen to catch a bit of one evening, and suddenly we’re swept up into it not just as viewers, but participants. All of the millions of people watching are what help create the make or break of that moment. We hold out fifteen minutes of fame at the finish line, but we can barely offer up enough of our attention spans to see even that out, much less the life that athletes must go on living after those fated moments and the ones that come after those. Like all else that goes into the Olympics, this stretch of the imagination to an afterlife must be even harder for the athletes than us happenstance observers. With so much focused on the time between the opening ceremony and the podium, how could becoming a regular person again feel like anything but failure?